Who Jamaicans commonly know as Ashanti, belong to the Akan tribe and these are the proverbs we inherited from our warrior ancestors, the Ashanti and their Akan counterparts. Along with a vast array of proverbs came Ananse stories. Picture of the Jamaican flag (known in Ghana as the Adinkra, Mframadan) and the Asante national flag. common meaning: Know your place in life. You fit in where you get it in. 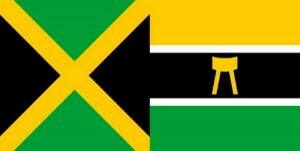 Jamaican proverb: When the cow’s tail has be cut off, God brushes away the flies. common meaning: Give to the parents instead of to the child.